Well, what do you know... it's December! And with that, we welcome this festive month with nothing less than a GIVEAWAY. I'm so excited to be celebrating my birthday and Christmas, so I'm sharing the excitement! 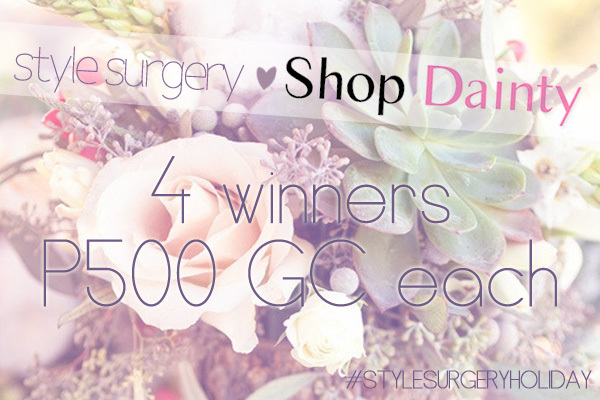 First up, here's a giveaway from our lovely friends at Shop Dainty! Send some holiday greetings and love down their way! To join, just follow the steps in the Rafflecopter below. Note: If a winner is from outside of the Philippines, the amount will be converted into your currency. I'd love to enter, but I don't have a twitter! I love your pretty style though! Would you like to follow each other on GFC and lookbook? This dress (http://daintyshop.multiply.com/products/listing/10570/OH-SDC025) is my favorite!